Balancing Jane: Unpopular Opinion: Do You REALLY Care About Thanksgiving Employees? Unpopular Opinion: Do You REALLY Care About Thanksgiving Employees? I've been seeing a lot of posts popping up in my social media feeds that are dividing companies into two realms: the money-hungry corporate thugs that would dare to make their poor employees work on Thanksgiving Day and the kind, loving companies who recognize the value of family and have given their employees the day off. Today I saw Think Progress (a site I follow because they cover stories that align with my own politics very often) post "The Progressive Guide to Holiday Shopping." Other posts with similar themes abound, including calls to boycott Thanksgiving shopping or to boycott stores that open on Thanksgiving for the entire holiday season. I'm going to try to approach this delicately because I think that my point can be easily misunderstood. First of all, I support everyone's right to boycott any place they don't like for pretty much any reason. You should spend your dollars in ways that align with your values. Boycotting is an important way to influence decisions higher up on the corporate food chain, and I don't want to diminish the power of that action. Secondly, I've been on many sides of the working-on-Thanksgiving perspective. For one, I worked at Wal-Mart throughout my undergraduate years. I worked Black Friday sales (because this was before Black Friday sales actually began on Thanksgiving evening), but I also worked on Thanksgiving Day because Wal-Mart has always been open on Thanksgiving. Yes, it's true that they didn't always promote the extreme sales on Thanksgiving Day, but we were a 24-hour store that only closed for Christmas Day (and I worked Christmas Eve, too). That was only a few years out of my life, though, and since then I have sat in a position of privilege that gives me pretty much every holiday off because I work in academia. Of course, I've spent many a holiday (as I will likely spend this year's) working at my own pace on academic projects, but that's not the same as being forced to stand in a retail store while customers punch each other over the last Elsa doll, and I won't pretend that it is. What has had a greater impact on my holiday traditions is the fact that my mom also works at Wal-Mart and has done so for over a decade. She works a lot of holidays and a lot of odd hours. We've always had to plan our family get togethers around her schedule, and it's not always fun, but you do what you've got to do. I tell you all of that to help shed some light on the fact that I'm not coming at this issue from a point removed. In fact, my family and I have been very much directly impacted by these decisions. I understand why people want stores to close for the holidays, and it is a position that I have very much felt myself. However, I have my suspicions that these boycotts and angry posts and litmus tests for "progressive" shoppers have less to do with the actual employees and more to do with the corporate encroachment on traditional values. For one, we are singling out a very specific type of employee experience at which to point our outrage. I know several people for whom it is tradition to go out to a movie on Thanksgiving and Christmas. I've got news for you: movie theaters aren't staffed by robots. That popcorn? Those tickets? The vacuum cleaners? They're all managed by human beings who have to work on their holiday to feed the consumer drive for holiday entertainment. I actually got into an argument about this around this time last year. The arguer said that was "different" because going to a movie was a family-centered event and shopping wasn't. I'll concede that going to a movie together may be a more family-centered event for the family going to the movie, but this outrage is allegedly about the employees, not the customers (who have a choice in the matter that the employees do not). If you go to the movies on the holidays or stop by a restaurant or even run to the grocery store when you realize you forgot a crucial ingredient to your famous Thanksgiving pie, you are part of the consumer culture that keeps retail employees on the clock during the holidays. If you do those things but get up in arms about those "poor employees" having to work during Black Friday sales, you're being dishonest (with yourself if nothing else). I suspect the actual issue is that those Black Friday sales are alluring. We live in a culture where the actions of others are more influential than ever since we see them all the time in our social media feeds. In fact, it's gotten so bad that we've coined a new disorder for it: FOMO--the Fear of Missing Out. A lot of people (and I am not one of them, as I'd rather walk across broken glass barefoot than go to a store on Black Friday) sincerely enjoy Black Friday shopping. They get a thrill from the deals and for many it is a social event that has its own family and friend traditions built around it. When stores started creeping back their Black Friday sales times until they got earlier and earlier, though, people's habits were disrupted. When you have to line up at 3pm Thursday to get a Black "Friday" sale, you have to make a tough choice. If you don't want to feel the FOMO, you're going to have to give up your holiday. And if some of your family members make that choice while others do not, it can seriously disrupt the dinner table seating arrangement and make the charades teams uneven. 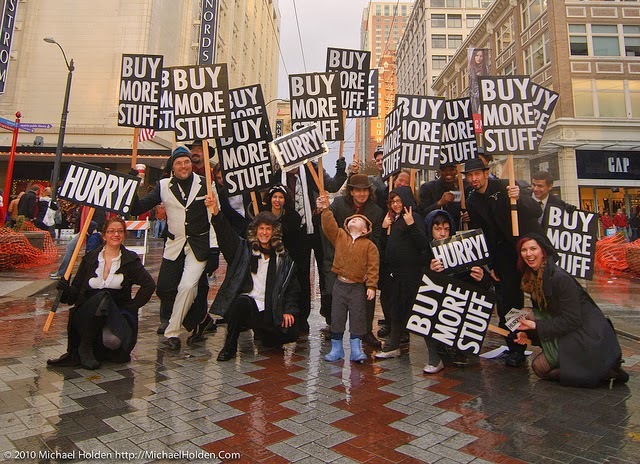 Those stores really are disrupting the holiday by insisting that Black Friday start during Thanksgiving, but in order to get to the heart of it, we have to admit as a culture that we're making a conscious choice to continue shopping and let them disrupt it. So I think that most of our outrage is a scapegoat. We're* pretending to be outraged on behalf of the poor overworked employees (who deserve outrage for a myriad of reasons including erratic scheduling, poor benefits, and a host of questionable year-round business practices) when what we're really outraged about is our own consumerist behavior. We looked in the mirror and didn't like what we saw, so we pointed to the employees we normally ignore under the guise of family values and concern for their well being. 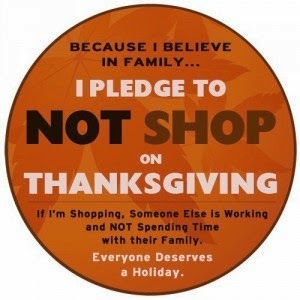 The bottom line is this: as long as people shop on Thanksgiving, there will be stores that will be open. The families impacted by that decision will build their holiday traditions around that reality. Yes, that is built out of greed and more than a little sad, but reducing those workers to a prop that's wielded while their plight is co-opted isn't really sincere--especially if it means we can pat ourselves on the back and ignore that same plight in, say, January through October. *-I realize this "we're" sounds all-inclusive and that there are many people who fight for workers' rights year round. You're excluded. But you have to admit that the movement has surged for the holidays in a way that it doesn't any other time. I don't think everyone's concern is genuine. I'm not American and I do not live there but, for me this just sounds like the well known (by me at least) all-or-nothing argument. "Oh, you care about African-Americans? what about all those starving kids in Africa what do you do about them? and I see you don't only buy fair trade local stuff so, I guess you're a hypocrite then"
People caring about ONE thing is better than nothing, even if it's popular to emphasize this one specific thing and people are ignoring the rest. We can't fix everything at once. Thanks for the comment. I agree that the all-or-nothing argument is a problem, and I absolutely think you can care about more than one thing at a time and focus on fixing a specific thing. But in this case, I think people actually DO care that stores are open on Thanksgiving and that Black "Friday" sales have been pushed back to Thursday; I just think they're being dishonest about the motivation for that anger. I think that a lot of these memes and articles are using retail workers like puppets in a play instead of actually paying attention them as people. I guess you're right, still I think it is better than nothing. I don't care much about what motivates people to do the right thing, unfortunately I don't expect from people to do the right thing when it is not convenient for them like I used to...and if they do it to feel good about themselves so be it. You're right that there's a more pragmatic way to look at this, and maybe I should just be happy that there's attention drawn to the issue. I know I'm not perfect in my ethical consumption (especially when it comes to, say, eating only ethically grown/raised food), but I try to be consistent and honest about my motivations and efforts. This one just gets under my skin for some reason. Maybe the Christmas creep just has me in a Scrooge mood.